Bischoff Federnwerk und Nutzfahrzeugteile GmbH in Staßfurt is one of the top addresses among the manufacturers and servicers of hot-worked flat and parabolic springs in medium and small batch sizes, and not only in Germany. A spin-off of the family company is also ensuring Saxony-Anhalt’s good reputation as a site for industry with its innovative industrial brakes. Bischoff Federnwerk und Nutzfahrzeugteile GmbH in Staßfurt has for many years been broadly positioned in the field of flat spring manufacturing in order to be able to meet the varied requirements of the global market. “We produce hot-worked flat and parabolic springs primarily for rail and commercial vehicles and for agricultural machines,” says Managing Director Hartmut Bischoff. The main customers for the series-produced flat springs are companies in Europe such as German Rail, the Austrian Railway, Swiss Railway and various regional railway companies in Germany and abroad. This medium-sized company from the German state Saxony-Anhalt meets all the product qualification guidelines that are necessary for this, such as ISO 9001, the Q1 certificate of Deutsche Bahn AG and the HPQ and IRIS for global certification as a railroad supplier. In Germany, and in future also in the eastern bordering countries, this company from Staßfurt is also the original equipment manufacturer for all spring parts of the Middle-German vehicle manufacturer Multicar (now Hako GmbH). Recently, Bischoff Federnwerk, with its steel products, opened up an entirely new application area outside the mobility sector. “We produce large volumes of special flat springs for a Swiss manufacturer of seating furniture,” says Managing Director Hartmut Bischoff and points to a large pile of ergonomically shaped and gleaming steel parts. The made-to-measure steel springs give chair backrests a unique elasticity, relieving stress on the spine. The Staßfurt family company currently processes around 2,000 tons of steel per year, of which about 500 tons of steel is for refurbishing, and roughly 250 different kinds of spring steel. The number of employees has risen from eight in 1990 to a current level of 115 women and men. Manufacturing at the company headquarters in Staßfurt has been expanded to 8,000 square metres of production area. From next year, the production capacity is already to be almost doubled by the commissioning of new manufacturing plants for hot-worked flat and parabolic springs. The state of Saxony-Anhalt has supported the installation of the plants with a contribution of 1.15 million euros towards the required finance volume of 4.6 million euros. Most of the rest is being contributed by Bischoff Federnwerk und Nutzfahrzeugteile GmbH. 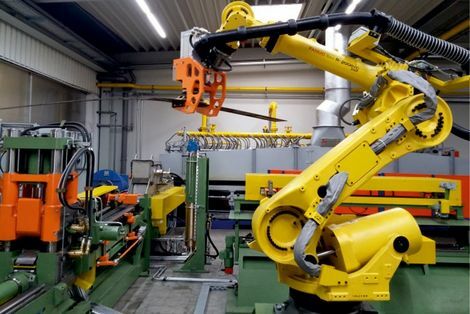 “The new, semi-automatic production lines will replace physically demanding work,” says the Managing Director Hartmut Bischoff: The automatic production lines will nevertheless not lead to the laying off of company employees, he says. The reason for this optimism: The craftsmanship of the company’s employees is needed – especially when it comes to custom products made according to patterns or drawings and the reconditioning of springs of vintage vehicles. The Staßfurters are particularly proud of having worked on the reconstruction of the first German steam loco “Adler”. Unfortunately, apart from the large boiler, most of the parts of the “forefather of all German steam locomotives” have been lost over the years. Luckily, many original construction drawings have been preserved. Building on these, the Staßfurt Federnwerk was able to manufacture an accurate reproduction of the original large flat springs of the steam locomotive “Adler”. The employees of this company from Saxony-Anhalt also produced custom-made flat springs for a Mercedes Benz racing car from the 1920s, which is now exhibited in the German Transport Museum in Sinsheim. These and other projects have since made the Staßfurt company well-known among vintage vehicle fans as well, and one of the hidden champions from Saxony-Anhalt. At the same time, for many generations, the company has also time and again introduced new technical innovations. For example, the employees developed energy-saving and low-wear braking systems for industry and vehicle construction. Just under a decade ago (2008), at the Hanover Fair, the company won the Industry Award in the category of drive technology, with small, compactly designed electromagnetic brakes. The brake, for which a global patent has since been applied for, is distinguished above all by optimising of abrasion, variable clamping forces and simple maintenance. There is global interest in this. The brake developed in Saxony-Anhalt has already found a use in a railway connecting two districts in the Chinese special administrative region of Macao. The innovative brake systems from Saxony-Anhalt can also be used e.g. in onshore and offshore wind energy plants, or as emergency stop systems on rollercoasters. Because the brake systems developed in Staßfurt do not require any additional hydraulics, compressors or oil pumps, they are also ideal for use in production lines for medical products. The segment of industrial brakes has been separated from the family company and is managed as the independent “Bischoff Industriebremsen GmbH”.